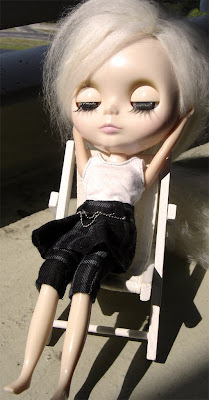 I found this Blythe photo by Rebecca Berger on her Flickr site and it "spoke to me" as they say. Hope to get in a little of this over the weekend. How about you? Any plans? Whatever you are up to, I hope you have a refreshing 2 days off! SALE AT CLAYTON GRAY HOME!! Congratulations to Annechovie sponsor Wendy Garraty and Clayton Gray Home on the opening of her new bricks-and-mortar store in Tampa. 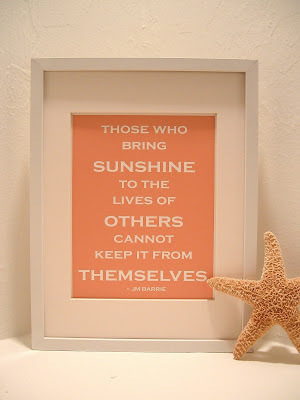 She also has many new items online, as well as a SALE! Don't forget, she ALWAYS offers free shipping as well. Now that's hard to beat! 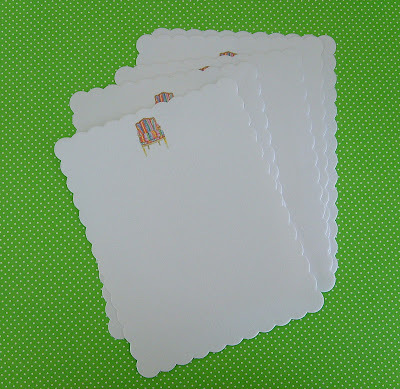 New "Anna Spiro's Chair" scalloped note cards, as well as chair prints, are available now in my Etsy shop! I had to paint it - and I did. I sent it to Anna and she was kind enough to post on it yesterday, along with photos of it on some more beautiful upholstered pieces in her shop. 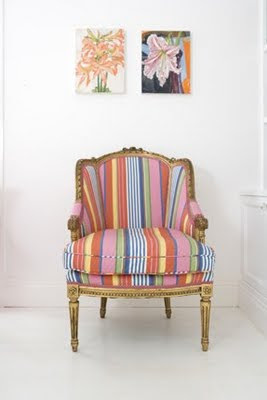 I adore Anna's bright, cheerful style and celebration of color. 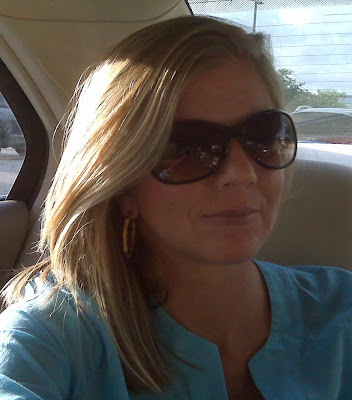 She is definitely one of those "kindred spirits" you meet in life and, more specifically, through blogging. Thank you, Anna!! 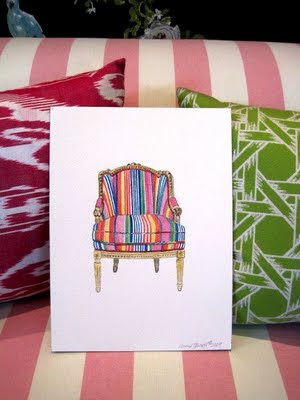 Prints and note cards of Anna's chair are now available on my Etsy site. When I was kid, the back to school season brought mixed reviews for me. I was excited about catching up with friends and getting some new shoes, clothes and notebooks. Remember those "TrapperKeepers"? I was always obsessed with school and office supplies and one of my favorite childhood acquisitions was a mini red swingline stapler - go figure. Despite the "newness" of an impending school year, a large part of me hated to say goodbye to carefree Summer and the homework-less zone. The gracious and uber-creative Kate van Geldern over at DomestiKated Life has been featuring some fun fantasy back-to-school lists by bloggers lately and you can check out mine here if you're curious (or bored!). 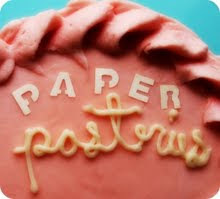 Paper Pastries is a Los Angeles-based stationery company that I recently read about on Beach Bungalow 8. 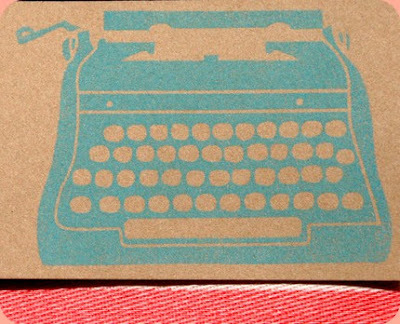 Owner/Artist/Blogger Margaret Haas creates some very cool vintage inspired designs, such as the typewriter above. I was left awe-struck by her lovely calligraphy - she will custom design a handwritten invitation just for you! 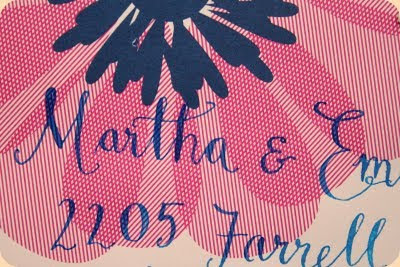 I love the pairing of hand calligraphy with blue ink on this pink-y floral envelope. 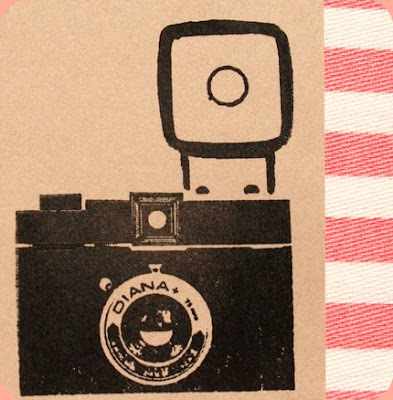 This camera is just one of several designs included in her "Classic Cameras" stationery set available in her Etsy shop. I loved it! Also, don't forget to visit Margaret's blog, too. Visit ArtQuiver now and check it out for yourself! I would like to introduce Annechovie's newest sponsor, The Inglenook Decor, a modern vintage decor site specializing in chic finds for your home. 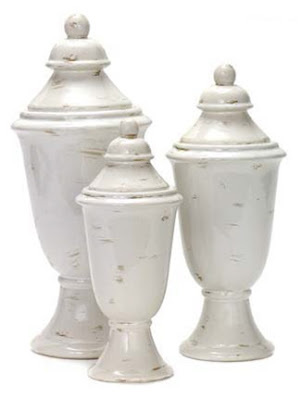 Here are just a couple of items from The Inglenook Decor that caught my eye - these antique white lidded jars in a set of 3 - perfect for the kitchen, bathroom or anywhere you need some great looking storage! 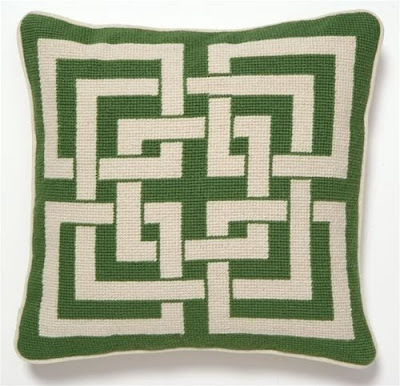 How chic is this Shanghai Links pillow? Classic, yet cutting-edge at the same time. 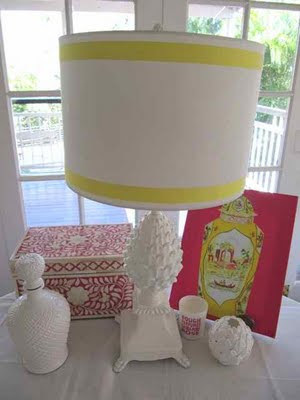 The owner of The Inglenook Decor, Maureen Toribio, also authors a great blog, Ingletalk, with decor and design tips and inspiration. 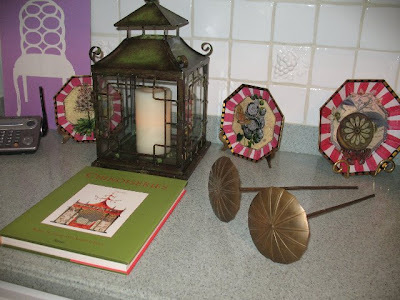 These photos give you an idea of Maureen's style and her gift for mixing new with old and creating hip settings with flea market finds and stylish accessories. 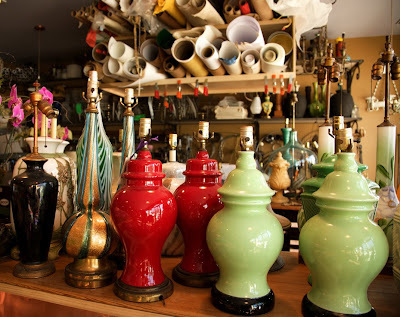 Please take a moment and visit The Inglenook Decor and shop their expansive selection. Thanks to Maureen and The Inglenook Decor for their support and sponsorship! I am very excited to have them on board!! This week only!! 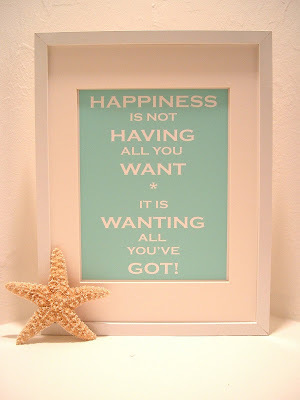 All quote posters are reduced from $25 to only $18!! Custom colors are available for an additional $5 - convo me on Etsy or email me here for custom orders. Sale ends August 22nd at 12:00 PM EST. Hurry and get yours now at my Etsy shop. I snapped my mom last Summer on the Veranda of the Ringling Museum in Sarasota, Florida. 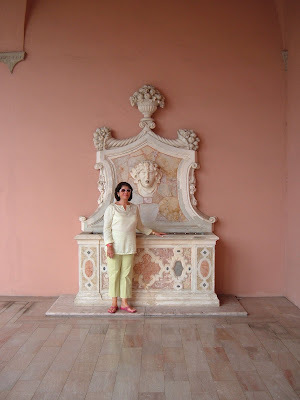 The entire estate is painted a beautiful rosy shade and the use of marble everywhere borders on the obscene. 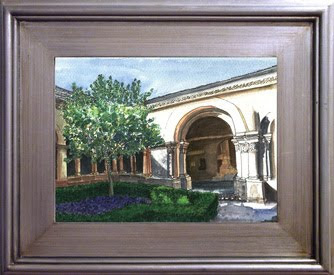 The architecture is stunning and the works of art by major Masters are amazing. Lounging in the sun? Better think twice - at least it looks like he's been using SPF 70 on his face. I guess he doesn't look too bad, considering he's been around since 1581. See what the elements can do to your skin when you don't protect yourself? This photo is of an ancient statue in Rome, Italy. 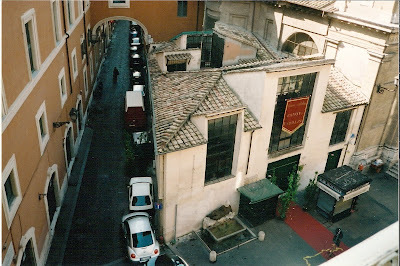 It was located directly across the street from a flat I stayed in on via de Babuino. We referred to him as "Mossy Guy", but he is known as "il babuino" or "the baboon" because of his less-than-attractive appearance. 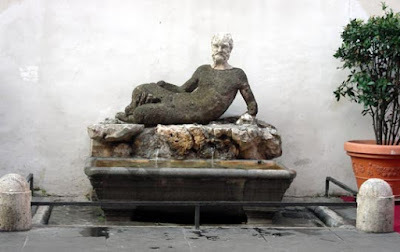 He's located on the corner of via del Babuino and via dei Greci and is just one of a multitude of fountains in the city. You can read more about him and his fascinating, uniquely Italian history here. I hope that you all have a fantastic weekend! Thanks to the gracious Laura Trevey for her post this week on my work! Laura is a talented artist and blogger herself. Look for her upcoming feature here on Annechovie and, in the meatime, visit her lovely blog. I am happy to introduce a brand-new print to my store. 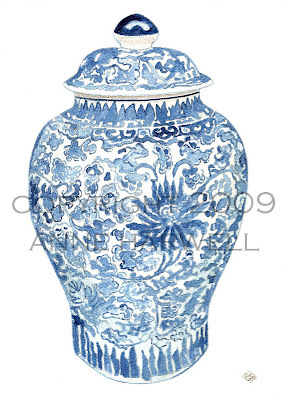 This recently completed gouache and ink painting was based on an ancient Chinese ginger jar. It's available now in 2 different sizes. It's also available on mounted canvas in several sizes (contact me here for details). 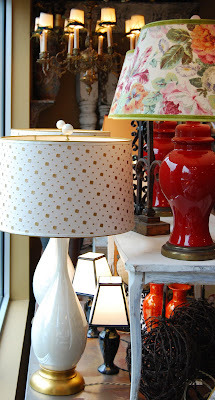 So fun to see my "Antique Porcelain Jar on Peony"canvas print all the way down under at the fabulous Porchlight Interiors! Tracey and Hailey are not only gifted designers, but two of the nicest Aussie bloggers you will ever have the chance to meet! Check out their post and blog here. I'm also loving this grouping below. Thank you so much for the mention Hailey and Tracey! 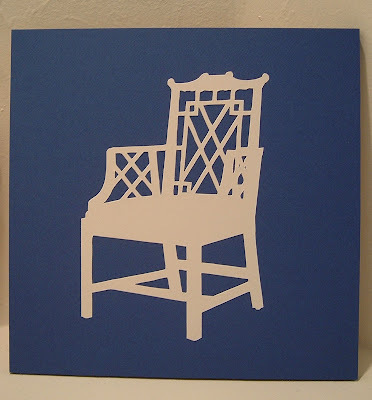 I have created another Chinoiserie Chair Silhouette, this time with a deep blue background reminiscent of the classic blue and white pairing found in so many vintage porcelain designs. This is an entirely hand-cut silhouette mounted on a 3/8 inch thick, 12x12 inch board with black painted sides and groove in back for hanging. 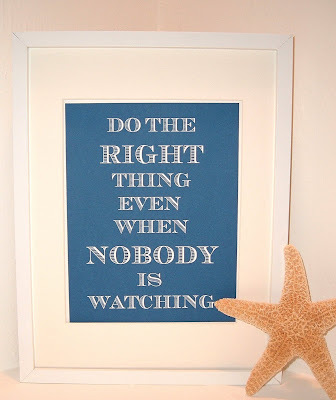 Does not require framing. 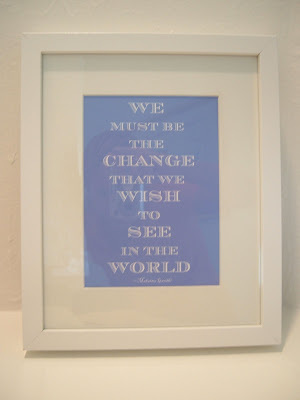 Would make a great gift for any style/design aficionado. Find it here in my Etsy shop. 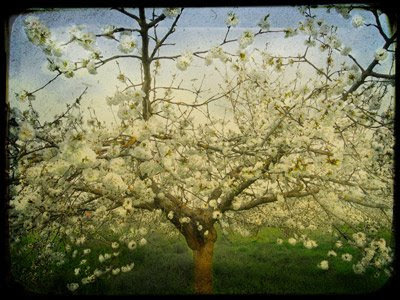 Congratulations to Sherrie who is the winner in this week's Tim Irving photo give-away!! She was chosen via random.org and her gift will be mailed out next week. Thanks to everyone for participating! 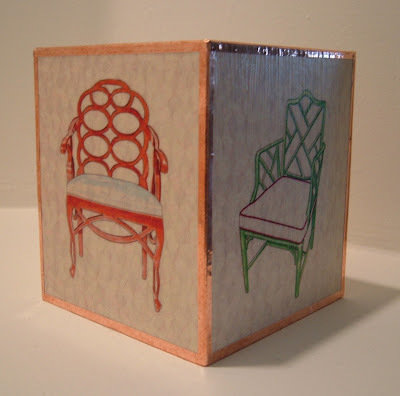 I'd like to thank Beth Connolly of Chinoiserie Chic for her kind post last week! Beth has a love for all things Chinoiserie and sent me this photo of a vignette in her kitchen that features one of my silhouette collages and some plates by John Derian. Thank you, Beth! 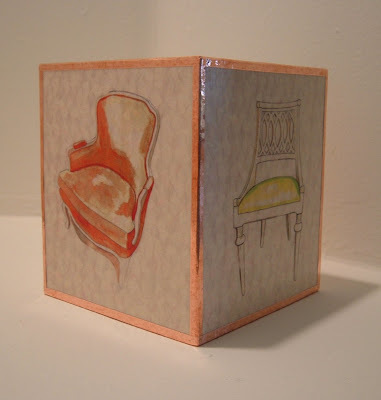 I discovered the beautiful work of artist and blogger Susan Schneider last year after she left a comment on my blog. 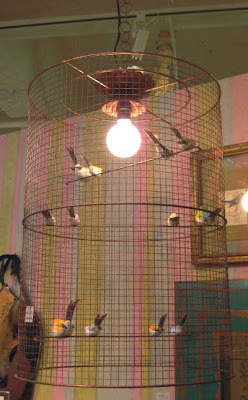 She specializes in creating all sorts of decoupage pieces for the home, vintage lighting and gorgeous lampshades. 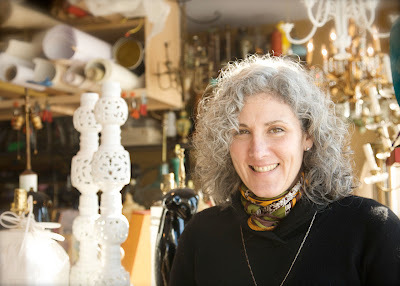 Her shop and studio is located in a newly renovated, century old building in Millerton, NY. She is currently having a 15% off sale that runs until August 15th, so don't miss checking out her site or shop! She has kindly agreed to a mini interview here with me so we can find out more about the lady and skilled craftsperson behind Shandell's. What would you take if your house was burning down? 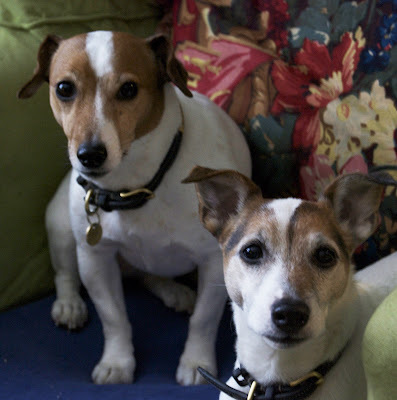 My dogs, a 19th century document box filled with memories and a couple of pieces of jewelry. All of them, my vast collections of cook books, design, textile, antique, horses, garden and more. I looked through them all and could not pick one out. If you could have only 1 last meal, what would you want on the menu? A table full of appetizers and desserts. Smoked fish of all types, caviar, Shortbread cookies, peach pie. Strangely cold, summers are okay but anything past 70 is too hot. 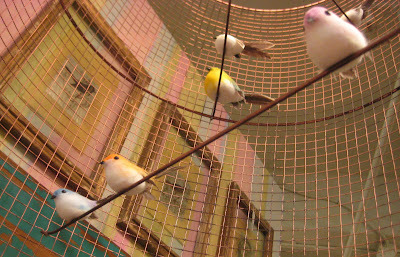 Art of animals and pansies are my favorites, vintage art no matter if it is signed or not. John Emms, Arthur Wardle, Richard Stone Reeves, Georgia O'Keeffe (she does not seem to fit my group of favorites, but there is something special about her and her art - a very different direction, a bit of fantasy) also, the Victorian women who had the pleasure and time to paint in groups. I also collect paintings of Pansies. 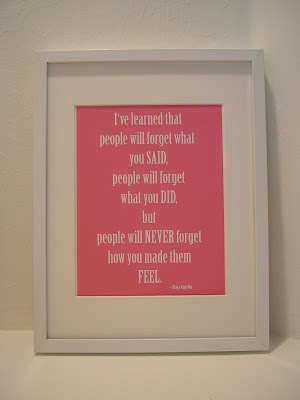 I do not get out of my studio much, Etsy has become my favorite shop. Ever changing merchandise, hand made by amazing artists. What more can I ask for. This is hard, I visit so many. These are on the top of my long list. Thanks to Susan for taking the time to share more with us on her life and work. 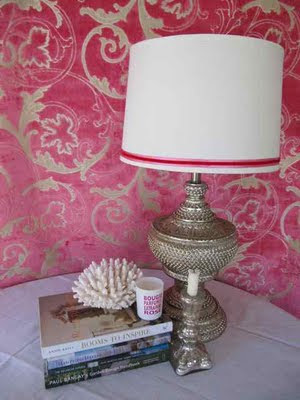 Be sure to visit her website, where you can read her blog and keep up with her latest creations! 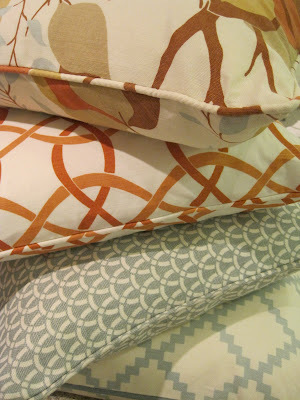 Lulu de Kwiatkowski’s new decorative pillow line for Matouk is here!! 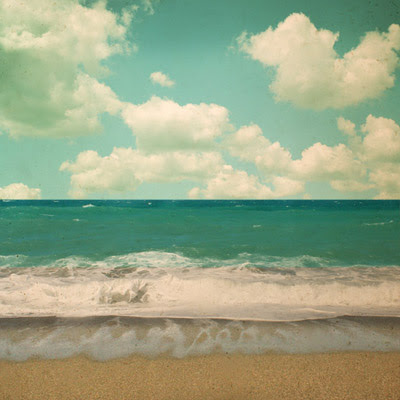 There are four color groups, Chocolate, Ocean, Honeydew and Sky. Fans of Lulu’s Chant pattern can now pick up these ready-mades in four colorways of Chant Reverse (previously only available to the trade)…in addition to five other Lulu DK patterns (Tulah, Bloomsbury, Color Wheel, River). 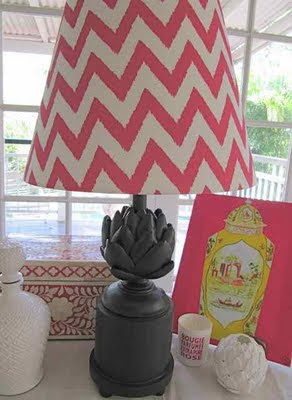 There are also some original embroidered and appliqued designs and a cool zig zag throw (soon to come!) 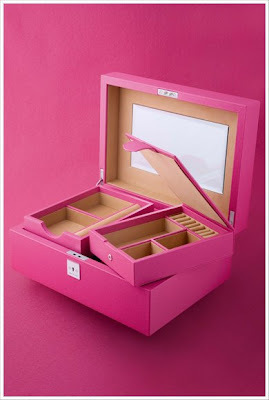 For more info on where to buy, click here. 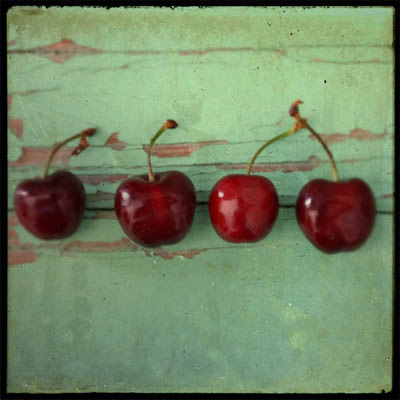 These beautiful images are from talented photographer Tim Irving, who lives and works in the Andalucia region of Spain. He is graciously sponsoring a give-away on Annechovie this week. Tim authors a blog by the name of StyleMed. It focuses on Mediterranean design and lifestyle. To enter the give-away, just visit Tim's shop and then come back here and leave a comment telling me which 3 photos are your favorites. The winner will be drawn via random.org and announced on Friday, August 7th.